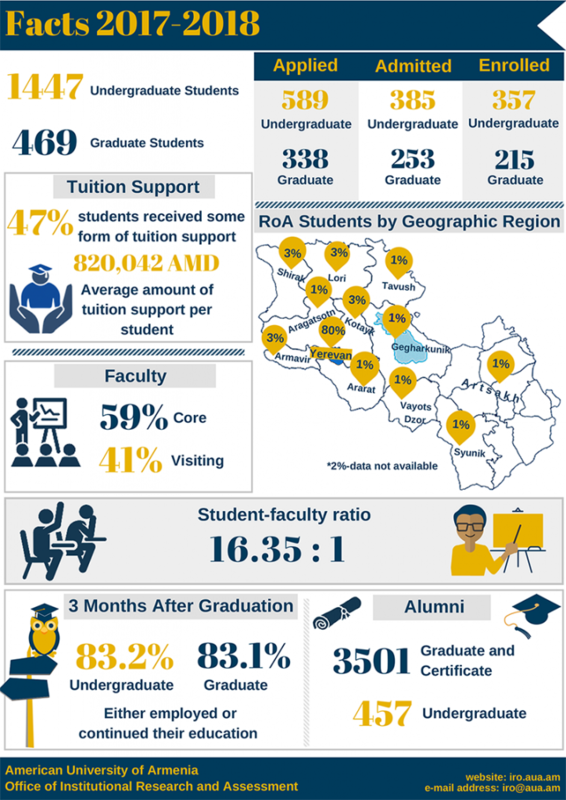 The American University of Armenia Factbook is a structured presentation of data about the University that is frequently asked by administrators, donors, students, faculty, staff, alumni, and other stakeholders. It contains statistics on student demographics, enrollment, academic performance, faculty, research centers, facilities, etc. The University's Office of Institutional Research (OIR) has compiled much of the data included in the Factbook from various University information sources to facilitate planning, budgeting, and decision-making processes of the institution, as well as to keep the University community informed. Efforts have been made to assure the maximal level of accuracy. However, should you have any questions/observations we will be happy to double check any piece of information provided here. We express our gratitude to all who have contributed to the production of the AUA Factbook. If you have any suggestions or comments please contact us at iro@aua.am or (37460) 612516.